Many performers astound the audience in the circus' grand arena. 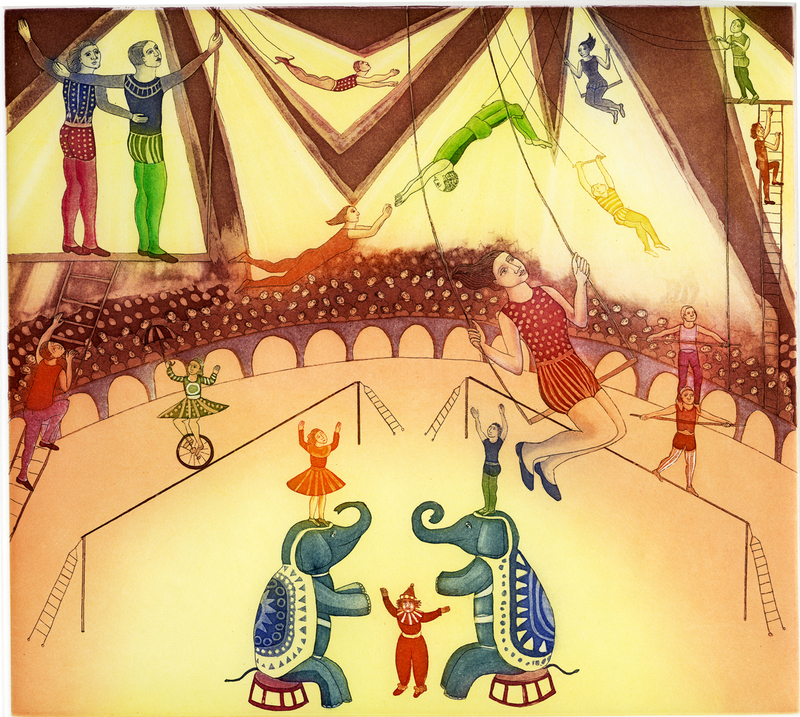 High above the center stage, the spotlight is on the trapeze, as a tight rope walker balances another on his shoulder, a girl rides a unicycle, and clowns and Elephants perform. The trapeze performers show no fear and take daring leaps trusting that they will succeed, and their partners will catch them. As we watch, we feel exhilarated to see them transcend their fear. FLYING TRAPEZE is a two plate etching: performers on one plate, and the circus ambiance on another. Tonal effects were acheived through use of Aquatint, and colors were rubbed into the plates using cotton daubs, à la poupée. An original, hand-printed etching published by the artist with collaboration of master printer Richard Spare at Clarendon Graphics, London, England. Dimensions: Image: 10" x 11"
Paper: Somerset English mould-made rag, T.P. Textured.